Peppe's - Italian restaurant Peppe’s is a cosy bistro specialising in the pure flavours of authentic Italian cuisine. The owners chose TAL’s Cu29 collection for a supporting lighting experience, the glossy copper of this collection displaying absolute purity and seduction. Thanks to, among others, LUZIEN, BERRIER and NUTS, Sicily’s most flavoursome food is beautifully presented in brilliant light. website: www.peppes. Lamps Caret Globe & Squirrel From now on, TAL also offers the beautiful CARET design lamps separately. Both CARET SQUIRREL CAGE and CARET GLOBE 115 can be purchased via TAL. This type of lamp (CCFL) is ideal for the high-end market that aims to stand out and is highly committed to quality and design. 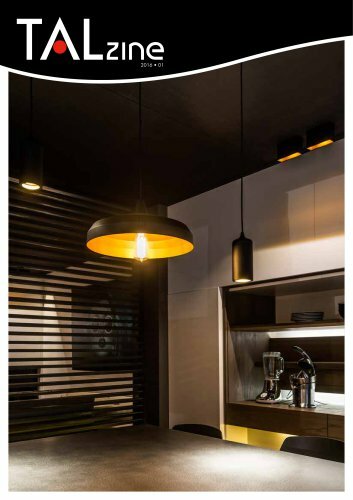 Our E27 luminaires such as NUTS, LUZIEN, ROBAN and – soon – OLIVE do ask for a gorgeous lamp. Mini Helax Project : restaurant Harte Troef Bistro Harte Troef is the perfect place for a savoury lunch, sweet treats or delicious dinners. Obviously, the stylish lighting is one of the assets of this cosy restaurant. Maison & Objet (Paris) In September, TAL participated in the prestigious design and interior decoration fair Maison & Objet in Paris. We showed, among others, HABANA, the newest addition to our THINK small collection, and our now famous KING GEORGE. We also presented the brand new, perfectly crafted antique brass, antique bronze and tin finishes of the NUTS suspension. Product improvement Quad Orientable Beaufort Unlike QUAD Moving, QUAD Orientable – as the name suggests – can be oriented. As you can turn the light in any direction, QUAD Orientable is perfectly suited to be used for accent lighting. The device is also equipped with the warm and cosy Beaufort technology. Lightlab is a unique event at which design and light come together. Obviously, trendsetting lighting manufacturer TAL had to be here as well. We displayed, among others, our new track devices and our profiles with state-of-the-art T5replacing LED modules.